The people of Punjab are very social and like to eat and dress well. They are always in high spirits. Punjabis are liberal minded open to new changes. It is a matter of pride or them to be "up to date". They have the enterprise and capacity to work hard and their deepest ambition is to "be their own boss." A generation ago, the turban was the "crowning glory" of all Punjabis whether Muslim, Hindu or Sikh. Muslims and Hindus have given up their turbans, but it literally remains an article of faith for Sikh men whose religion forbids them to cut their hair. The kurta, a long straight-cut, loose shirt teamed with pyjamas, the loose baggy salwar, or a kind of sarong called a loongi or tehmat makes up the traditional dress for men. Winter sees the rustic Punjabi in colorful sweaters that their wives and mothers are so skilled in making. A blanket finishes his ensemble. When the urban, educated Punjabi steps out to work he will be in a formal shirt and pant or a suit. Back home in the evening, he is likely to be found in a more traditional dress. The traditional Punjabi shoes, called juttis retain their popularity with both rural and urban men. They are both elegant and comfortable. Patiala and Muktsar in Punjab are famous for juttis. It is impossible to tell by dress whether a Punjabi woman is a Hindu, Muslim, Sikh or Christian as they all dress in salwar kameez. The kameez is a garment that can be fitted like a dress loose like the kurta and accented by a rectangular scarf about 2.5 meters long called the chunni or duppatta. A Punjabi woman is fond of her sweaters, but she is passionately proud of her collection of woolen shawls. These can be breathtaking. The women of Punjab are responsible for the states most famous item of handicraft - the Phulkari. Gold is a Punjabi womans weakness. The newly wed Punjabi brides are loaded with it. The jewelers of Punjab stock an enormous range of designs in bangles, necklaces, rings and earrings, nose-pins, ornaments to pin in the hair, anklets and toe-rings. A particular kind of bangle is the tip of in recognizing Sikh men and women. Its called the kada and is made of steel. The kada has a religious significance for the Punjabis. Weaving of Durries (cotton bed or floor spreads) in myriad motifs and designs especially by young girls in the villages has been a long tradition in Punjab. These are also woven in stripes, check boards, squares, and motifs of birds, animals and even plants as a part of dowry. Needlework of Punjab is very unique. It has been given beautiful names because of its associations with beautiful aspects of life and the beautiful designs, which the skillful fingers of Punjabs proverbially beautiful women create. These designs have such a wealth of forms and motifs that they defy enumeration. Some of these are called Baghs, literally meaning a garden, Phulkaris, meaning flower work. These patterns of needlework are done on the bedspreads, chunnis, dupattas (used to cover the head) and shirts and salvars. Phulkari work is one of the most fascinating expressions of the Punjabi folk art. Women have developed this art at the cost of some of their very precious moments of leisure. They have always been very fond of color and have devoted a lot of their time to colorful embroidery and knitting. It has also been customary for parents and relatives to give hand-embroidered clothes to girls in dowry. Punjabi women were known for embroidery with superb imagination. Phulkari is something of which Punjab is justly proud and is also noted as the home of this embroidered and durable product. In the Phulkari work, the whole cloth is covered with close embroidery and almost no space is left uncovered. The piece of cloth thus embroidered is called bagh meaning a garden. If only the sides are covered it is called chope. The background is generally maroon or scarlet and the silken thread used is mostly golden. Colour schemes show a rich sensitiveness. Some Phulkaris are embroidered with various motifs of birds, animals, flowers and sometimes scenes of village life. Phulkari, meaning flower work, is a spectacular style of embroidery peculiar to Punjab, and an essential part of everyday life. Almost every ceremony in which women participate is given a touch of additional color and richness by the use of Phulkari on account of its being considered auspicious. The rich agricultural states of Punjab and Haryana are famous for the phulkari (flower-work) shawls that are worn with a tight-fitting choli and gaghra. 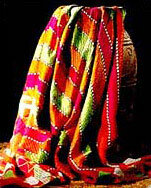 Phulkari forms the traditional costume of rural women of this region. It was a costume both spectacular and eminently practical. Phulkaris were made for everyday wear. Usually the border and field of the shawl were not so densely embroidered, with much of the ground cloth exposed. For ceremonial occasions, however, a special kind of phulkari known as a bagh (garden) was made, in which the whole of the ground was covered with embroidery, so that the base cloth was not visible at all. On the birth of a baby, the grandmother, after a ceremony of prayers and distribution of sweets to the babys aunts, would start to embroider a bagh. It would take several years to complete and was embroidered with special care to be used later at the grandchilds wedding, after which it would be kept as a family treasure. Phulkari work was both a labour of love and a social occasion. The female members of a family would gather in the leisure hours of the afternoon to spin with the charka wheel and embroider, although it was usual for a phulkari to be worked by one woman alone to maintain a uniformity of stitches. Phulkaris were made for family use, or as gifts; very rarely were they made for sale. Young girls would learn stitches and designs from their mothers and grandmothers and would then start to stitch a phulkari that they would later wear themselves. Motifs of flowers, birds and human figures were embroidered in soft untwisted floss silk (called pat in Punjabi) in combinations of gold, yellow, white, orange or red, on a ground that was usually a brick-red colour, but could sometimes be black or white. The design was embroidered from the reverse side using darning stitch over counted threads. Only one thread was taken up with each pick of the needle, leaving a long stitch below to form the pattern. Stitching ran in both horizontal and vertical directions in order to give a variation in texture. It is easy to imagine the effect the light, playing upon the smooth sheen of the embroidered surface, would have on these juxtaposed sections of contrasting stitchery. Although designs on Phulkaris were often figurative consisting of baghs and geometric patterning. In west Punjab the pattern, in the form of parallel lines or squares, was generally outlined in green thread before the bagh was embroidered. The work was of high quality and its geometric forms reflected the surrounding predominantly Muslim environment. Motifs and scenes from daily life, houses temples, flowers, animals, wedding rituals and processions were all represented in work from east Punjab, a colourful and lively display which made up for any lack of technical sophistication in design. All over Punjab and Haryana motifs used were drawn from nature. Images of vegetables and flowers, wheat and barley stalks, the sun, the moon, trees and rivers, Mughal gardens, kites and even playing- cards were stitched on Phulkaris and baghs. The embroidery was worked in silk thread from Kashmir, Afghanistan or Bengal, although the best quality silk was Chinese. Once dyed, at Dera Chazi Khan (now in Pakistan), Arnritsar or Jammu, the yarn was worked on a coarse hand woven cloth known as khaddar, which was produced in the villages by the jullaha (the visage weaver) in narrow widths of about seventeen to twenty -three inches. Two or three of these pieces would be joined together to form a Phulkari. Khaddar was locally available, cheap, hard-wearing and most importantly, it was preferred to mill-made cloth, as its coarse weave facilitated the counting of threads necessary for Phulkari work. It could also be embroidered without a frame, as it did not pucker or pull. Two other types of shawl should be mentioned. One is the chope, which is presented to the new bride by her maternal grandmother. It is embroidered in straight two-sided line stitch, so that the patterning is identical on both sides of the cloth. The other is a type of bagh, embroidered in east Punjab is called darshan dwar. It was presented to temples on the fulfillment of a wish. The two outer panels of a darshan dwar are embroidered with a row of large, tall gates, each with a triangular top. The central band consists of human figures, animals, birds and flowers. Trains, peacocks, parrots, wedding jewelry and pictorial scenes from village life can also feature as favourite motifs. The embroidering of baghs and Phulkaris virtually ceased about forty years ago, after the turmoil and mass upheavals of partition in 1947. Hindus and Sikhs were forced to migrate from west to east Punjab and Muslims (who included the majority of the khaddar weavers) fled from east to west and the khaddar cloth thus became scarce. This forced migration, along with post-Independence industrialization, meant that many rural people moved to the cities. In the villages as well, some aspects of agriculture were mechanized and rural life generally became busier. Women were now educated, and were subjected to the influences of the modern media, which meant that they were no longer inclined to spend their leisure hours embroidering. All of these factors have played their part in the death of a fine rural art. Attempts to revive the art of Phulkari in Patiala and Chandigarh in east Punjab have failed because of irrevocable changes in the rural milieu. Similar attempts in Pakistan and west Punjab, have also met with little success. The traditionally used Phulkaris are now exported as wall hangings and sewn as jackets etc. to other places in the world. Punjabi hand fans, like the Japanese, are almost typical and their leaves are made in much the same way as Phulkaris are made. The shoes made in different parts of Punjab out of self-lured leather have different traditions. Light shoes were considered the best and to explain this aspect the cobblers used to say that even the sparrows could fly with them. Earlier shoes, which have come to be known as Punjabi Juttis throughout the world were embroidered with gold and silver wires all over in different patterns covering every part of the pair so that it looked as if it was made of solid gold and silver. Now even when golden and silver threads are used to embroider these shoes, the quality of these world famous shoes is still maintained.